Star Wars #55 introduces the planet Arbra which would serve as the main Rebel base until the events of Return of the Jedi. The planet's inhabitants are called Hoojibs. They are a telepathic, energy eating species resembling a rabbit led by Plif. Plif! also happens to be the title of the story inside. In the tale, Princess Leia is leading an expedition team on the planet Arbra which is looking very much like an ideal home for the Rebellion. During the first night on the planet, the Hoojibs drain the power from the Rebel equipment and weapons. Chewbacca captures Plif who apologizes for feeding on their energy and explains a creature called the Slivilith has moved into their home, a cave with crystals that draw geothermal energy from the planets core which the Hoojibs feed on. As he is explaining, the Slivilith, a flying green bulky creature, attacks, but the Rebels manage to drive it away with a couple of blasters wielded by the Rebels who were standing guard. Leia decides to help the Hoojibs and the creature is killed in the cave. In return, Plif invites the Rebels to live with them on Arbra as their guest. It is a decent story which is also adapted to a book and record set called Planet of Hoojibs. 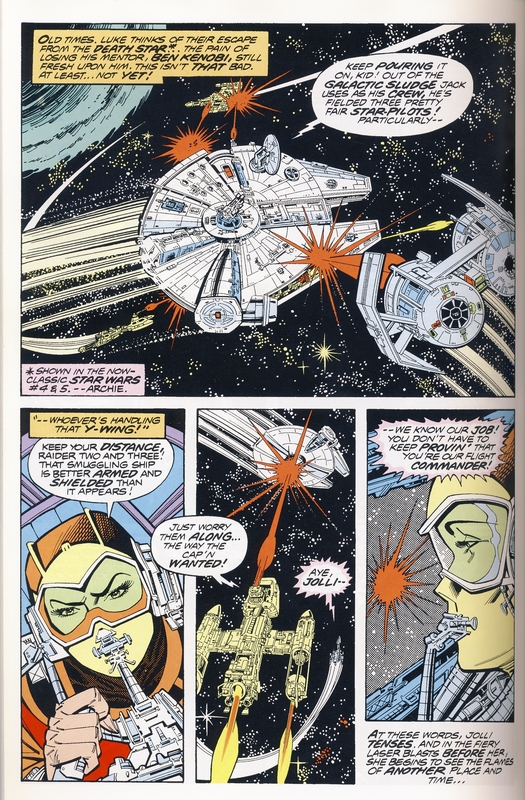 The highlight of the story is the artwork; Walt Simonson draws the story which Tom Palmer inks and the results are detailed panels reminiscent of an Al Williamson Star Wars strip. The cover for Star Wars #55 show the Rebels attacking the Slivilith in the crystal cave. In the story, most of the Rebel's weapons are drained of energy; Leia draws the creature into the cave with one of the working blasters and it is actually Chewbacca that kills the creature by throwing it into the razor sharp crystals. 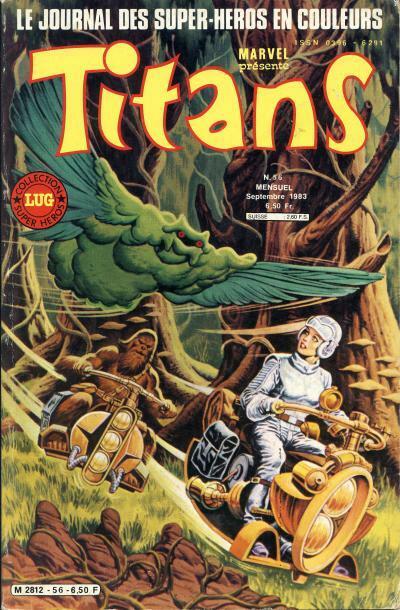 The cover for Titan #56 shows Leia and Chewbacca on air bikes (this predates Return of the Jedi which introduced the speeder bikes) being chased by the Slivilith. The story inside opens with the Rebels racing through the dense forest on these bikes led by Leia and Chewbacca before making camp. Leia's outfit on the cover is accurate to what she wears inside the comic. The bikes are not used again in the story, presumably having been drained by the Hoojibs. Neither cover is representative of any actual scene inside the comic, but both do a good job of capturing the spirit of the story. 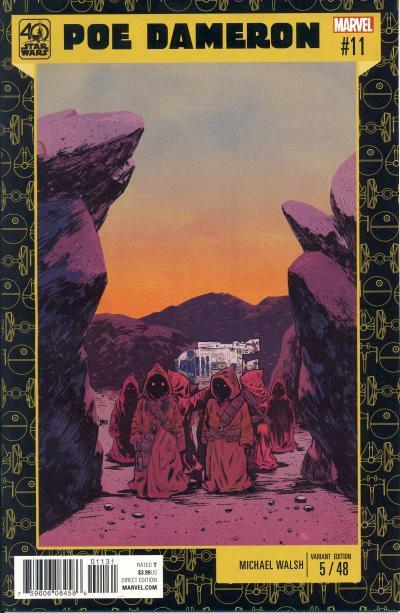 Walt Simonson's cover is dynamic, but the French cover does a good job of capturing the terrain of Arbra. I like both covers. Vintage Kenner Star Wars 3-packs are extremely rare. Each 3-pack contains three Star Wars action figures and are themed based on the figure assortment. There are a total of seven Star Wars and nine Empire Strikes Back 3-packs. While very few of these vintage sets existing, Hasbro has released sets with the newer action figures in vintage style packaging using the same themed assortments as Target store exclusives. Hasbro has utilized the vintage toy packaging many times over the years to appeal to collectors. The action figure variant covers for Marvel's Star Wars line have the same nostalgic appeal. John Tyler Christopher is the only artist to have worked on these covers. For the covers that show only one character, he has produced new "photo" images of the character while the drawing of the action figure looks much like the original action figure, where appropriate. Those action figure images are borrowed for the Wonderworld Comics action figure 3-pack exclusive covers. These covers are designed to look like a mail-away box with the three action figures in a plastic tray. Despite the vintage 3-packs to draw on for inspiration, these 3-pack covers borrow more from the mail-away boxes that were used for the original early bird sets, although those contained four action figures, not three, and were not themed. 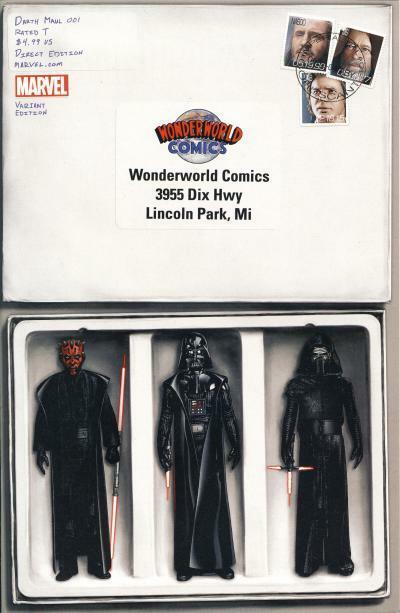 The first Wonderworld Comics 3-pack exclusive cover was for Vader Down #1. 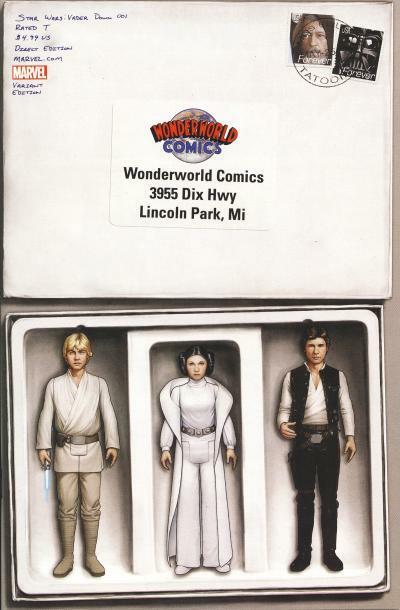 The three characters are Luke Skywalker, Princess Leia, and Han Solo, reminiscent of the original heroes 3-pack sets. 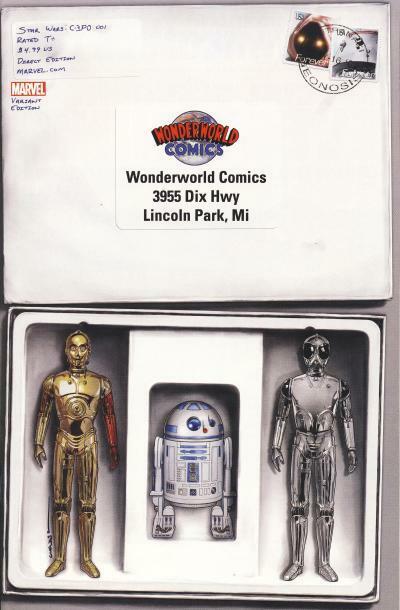 The C-3PO one-shot has a Wonderworld Comics exclusive that shows three droids: C-3PO, R2-D2, and the Death Star Droid. Darth Maul #1 had a total of seven exclusive covers, one of which is a Wonderworld Comics exclusive. This cover has a dark side theme with images of Darth Maul, Darth Vader, and Kylo Ren. The final Wonderworld Comics exclusive cover is one of only two exclusives release for Rogue One #1, both of which are action figure variants. 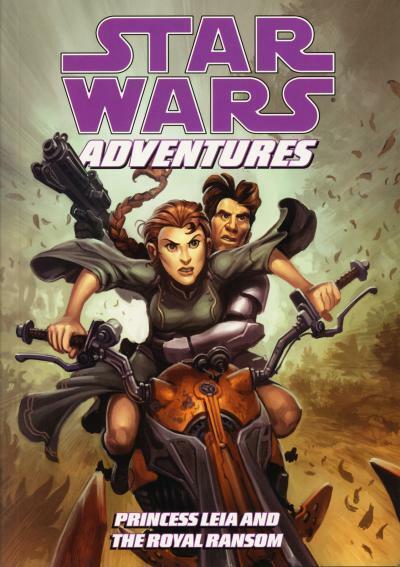 The three characters on the cover are: Jyn Erso, a Stormtrooper, and a Star Destroyer Commander. There really isn't a theme like the previous covers, unless three characters that appeared in Rogue One can be considered a theme. 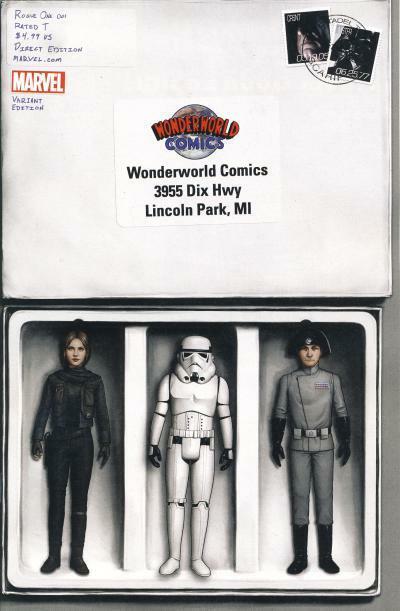 To date, only Wonderworld Comics has released these action figure 3-pack covers. Greek publisher Kabanas Hellas released Marvel Star Comics starting in June 1986 and it ran for 82 issues. The title contains Greek editions of comics published in Marvel's Star Comics line from the 1980s. 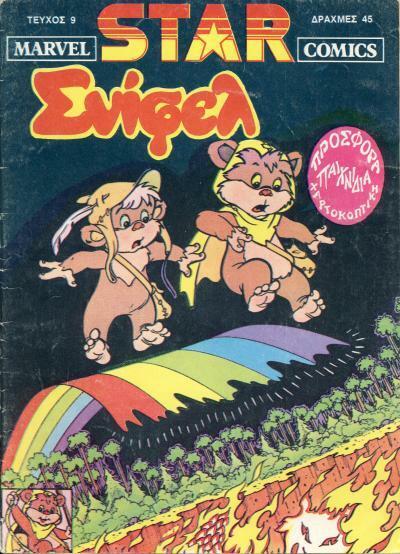 Issue #9 contains the Greek translation of Ewoks #1. 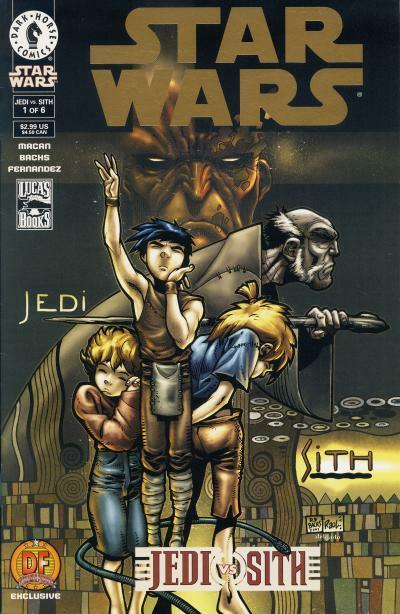 The cover art for Marvel Star Comics #9 is the same used for Ewoks #1. 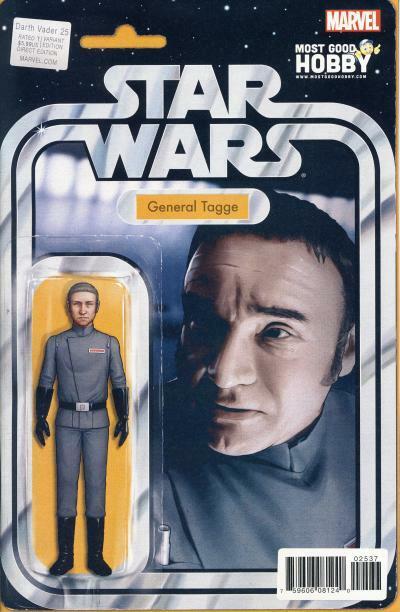 In the Expanded Universe, General Tagge died when the Death Star was destroyed at the Battle of Yavin. His siblings, Orman, Silas, Ulric, and Domina, are introduced in Marvel's original series and the House of Tagge are the main antagonist for the heroes in several story arcs prior to The Empire Strikes Back adaptation. In the new canon under Disney's ownership of Lucasfilm, General Tagge was not aboard the Death Star when it was destroyed. Instead, after the battlestation's destruction, he was promoted to Grand General and led the Imperial military; Darth Vader also became Tagge's subordinate. In Darth Vader #25 after a series of blunders including the loss of the Executor to Cylo, Tagge found himself demoted and reporting to Darth Vader who promptly used the force to choke him to death. 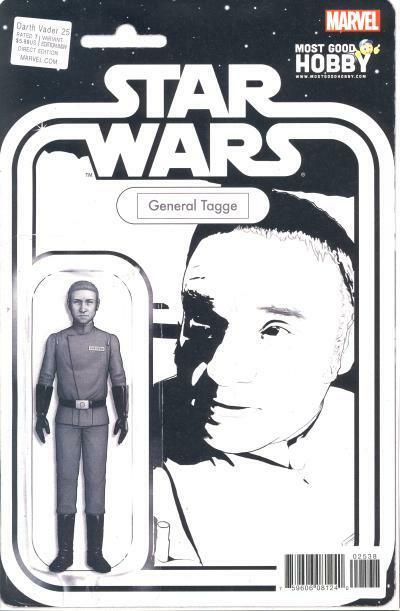 Most Good Hobby is an online comic retailer that released a John Tyler Christopher action figure cover featuring General Tagge for Darth Vader #25. This exclusive is limited to 3,000 copies. There is also a black & white version which is limited to 1,500 copies. Star Wars is a brand that appeals to both children and adults, so it is not surprising that Disney wants to see an all-age comic. 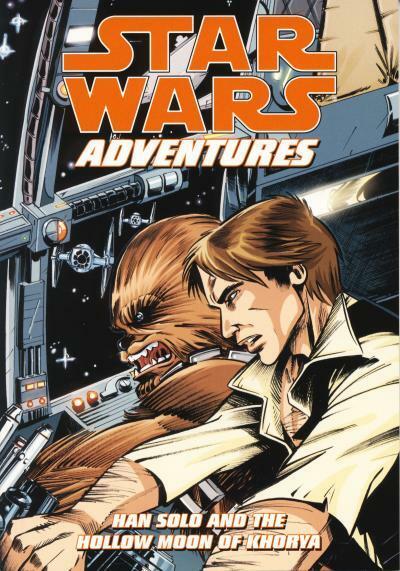 When IDW publishes Star Wars Adventures in the Fall, it won't be the first all-age Star Wars comic nor will it be the first comic titled Star Wars Adventures. 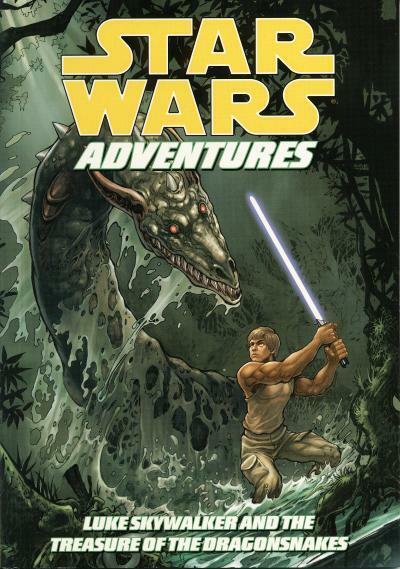 Between April 2009 and August 2011, Dark Horse published 6 digest-sized issues in their Star Wars Adventures title. Each issue of this title focused on one character. The first issue is Han Solo and the Hollow Moon of Khorva. 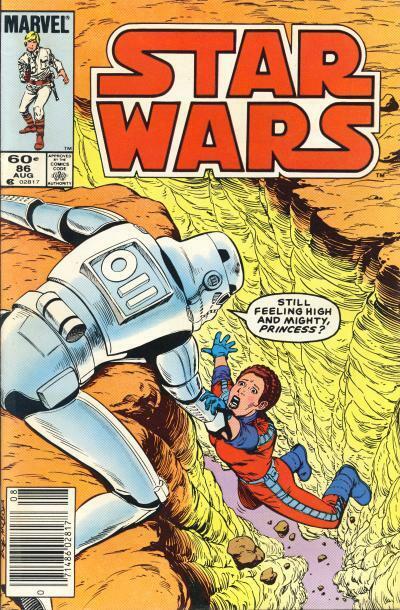 The second issue is Princess Leia and the Royal Ransom. 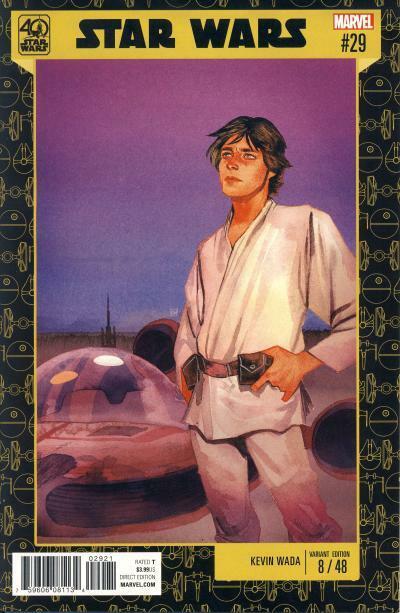 Not surprisingly, the third issue, Luke Skywalker and the Treasure of the Dragonsnake, focuses on the 3rd main character from the original trilogy. The focus shifts to the main villain in the fourth issue, The Will of Darth Vader. Continuing to focus on the villains, the fifth issue features a story about the popular bounty hunter called Boba Fett and the Ship of Fear. The sixth and final issue changes focus back to the heroes of the Rebellion in Chewbacca and the Slavers of the Shadowlands. Dark Horse published two issues every year for three years, which gave them plenty of time to see sales before soliciting the next issue. The first five issues all had initial sales in a tight range of 4,300 - 5,000 issues which was apparently high enough for Dark Horse to continue publishing the title. I'm guessing the low initial sales of the sixth issue of only 3,600 copies, is what prompted Dark Horse to discontinue the title. Note these comics appear on the trade paperback estimated sales list from the Comichron website, hence their high ranking. It is not known yet what format the IDW title will take. Physically, will the issues be published in the pamphlet format or the digest format? Will the title be an anthology and will each issue focus on one character? One thing is clear, based on how well Marvel has done with the license, IDW's title will have a higher awareness level than Dark Horse's initiative because of Disney and the continual release of new movies every year, which should garner it decent sales initially. I believe there is a market for an all-age Star Wars title, but I also believe that market is considerably smaller than the market the Marvel titles appeal to. I'm hopeful the demand will be high enough to allow it to succeed. Why Is IDW Getting a Slice of the Star Wars Pie? An interesting article, Does Disney See Marvel as a Brand, Not a Publisher?, was published over on ICv2. 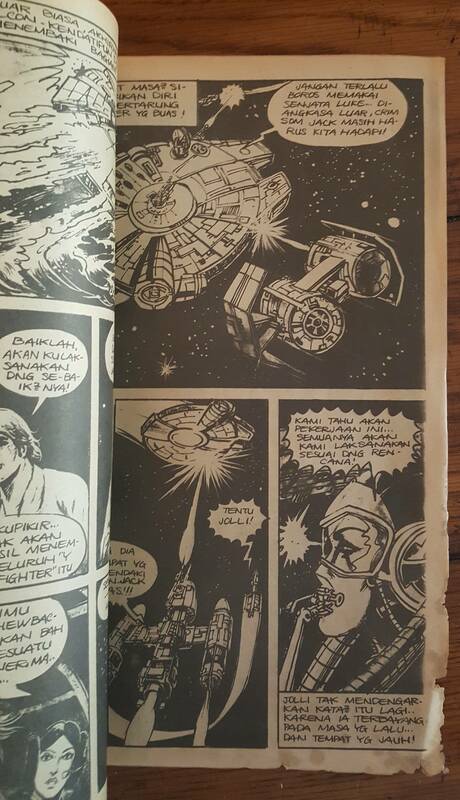 It speculates on why IDW was given a license for the all-age Star Wars comics instead of Marvel. It is definitely worth a read. 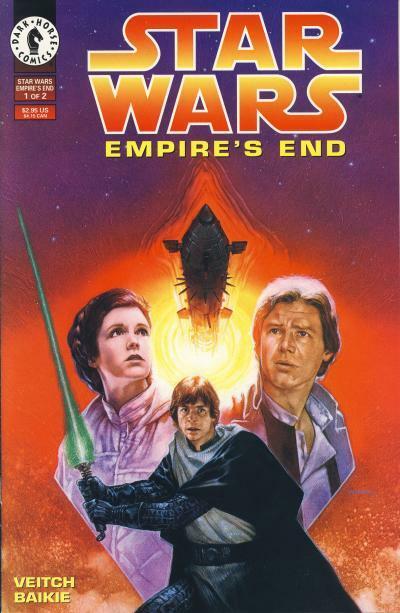 Star Wars: Empire's End is the third arc of the Dark Empire trilogy. This 2-issue mini-series chronicles Emperor Palpatine's final death. During the Dark Empire trilogy, Palpatine is resurrected by using clones and his final clone body is defective and aging at a fast rate. He makes one last attempt to keep himself alive by occupying the body of Han Solo and Princess Leia's third child, Anakin Solo. Han kills Palpatine's clone body, and Palpatine's spirit attempts to inhabit Anakin's body, but Jedi Knight Brand, a member of Luke Skywalker's fledgling Jedi Order, makes the ultimate sacrifice to prevent this from occurring. 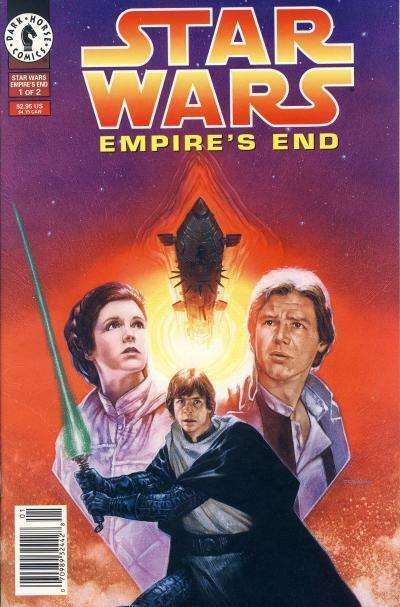 The cover to Empire's End #1 shows Leia, Luke, and Han. The Galaxy Gun is a super-weapon able to fire projectiles that can traverse hyperspace and are shielded and capable of defending themselves. The projectiles are able to destroy entire planets and one is shown on the cover above the heroes. 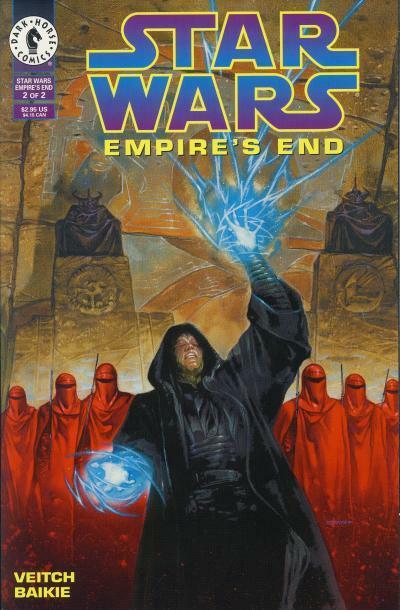 Emperor Palpatine is shown flanked by his Royal Guard in the Valley of the Dark Lords on Korriban on the cover of Empire's End #2. Dave Dorman provides the painted art for both covers. 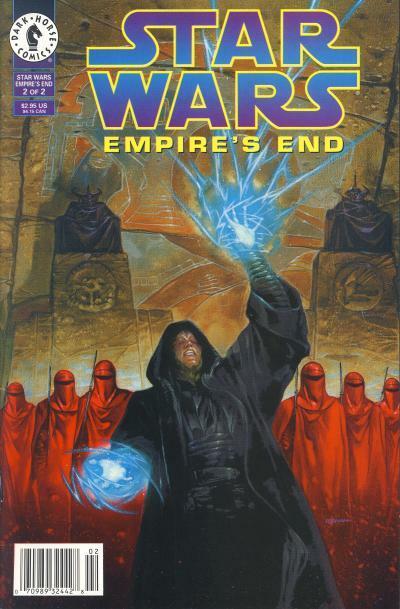 Empire's End is written by Tom Veitch, the writer for Dark Empire and Dark Empire II. Unfortunately, Cam Kennedy was not available for the interior art due to resigning, so the interiors are done by Jim Baikie. Baikie does an okay job of mimicking Kennedy's style for this final arc, although the artwork does at times lack some of the detail of the previous mini-series. To be fair, this final chapter in the Dark Empire trilogy is rushed, so Baikie cannot be entirely blamed. 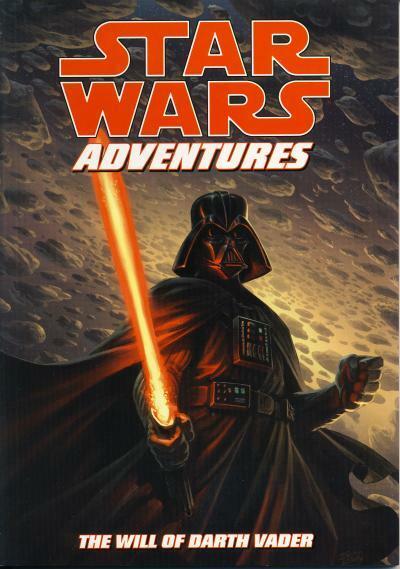 Tom Veitch: I can tell you the book was written and well-received by LucasArts. George read it and approved it. But due to the stodgy side of the business, we never received a contract! When George found out that he had approved the book without a contract, he killed the project. There was a tremendous uproar at that point and the axe fell in a number of ways. 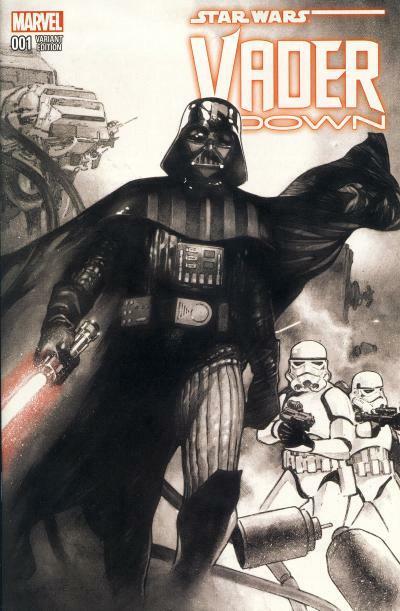 One of the major consequences was that a proposed third series of Dark Empire was cancelled, Cam resigned, and I was told to wind up the whole plot-line in the two-issue series that Jim Baikie drew. It was a sad day, but it shows you how the business side can hurt the creative side, even on a popular project. The legal beagles were slow to get out the contracts, and "1000’s of Bothans died", so to speak. The Expanded Universe is rich with planets and species for writers to use. Longtime readers were rewarded when a planet or species from an older story was referenced in a newer story. Dark Horse incorporated elements of Marvel's original series in their stories. This was the case with the Yinchori from the planet Yinchor who were introduced in Marvel's Star Wars #86 and were use again by Dark Horse in Star Wars: Jedi Council - Acts of War #1 over 15 years later. 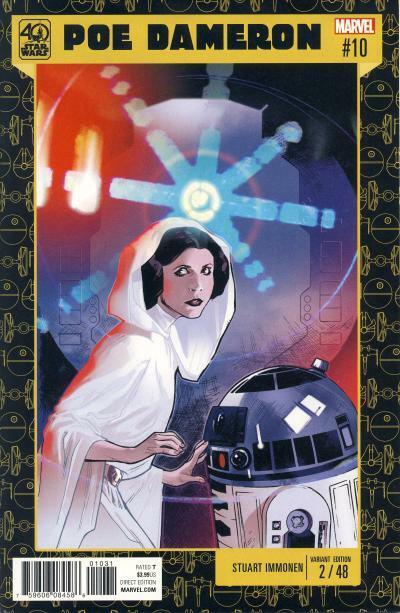 Star Wars #86 starts with Leia on a mission to Yinchor aboard a Yinchori shuttle. As they near the planet, she learns from the crew that she is being traded to the Empire in exchange for the captured Yinchori Elder Council. Needless to say, the Imperials do not hold up their end of the bargain and shoot down the shuttle over the planet and Leia is the only survivor, setting up the main story of her confrontation with an Alderaanian Imperial Stormtrooper. In Star Wars: Jedi Council - Acts of War #1, the spelling of Yinchor is changed to Yinchorr, but there is no mistaking the species. Yinchorri are green skinned reptilians with a turtle-like head and bulky bodies. 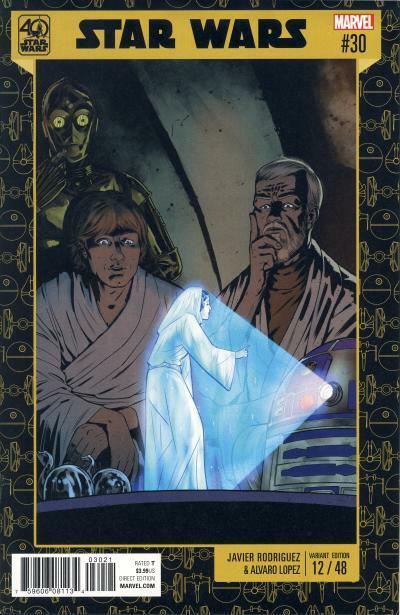 The story in the 4-part mini-series takes place prior to the events of The Phantom Menace. Darth Sidious manipulates the Yinchorri, recently brought into the Republic, into attacking nearby planets and the Jedi become involved in the Yinchorri Uprising. According to Yoda "... after so many years of relative peace, troubles me does a threat like this". Sidious himself tells Darth Maul that "Either the very stubborn and warlike Yinchorri-- whose inconvenient resistance to mind control could present a problem in the future-- will be brought low, or... Jedi will die." Much of this implies this is Sidious' first overt move into manipulating galactic events into the Sith's favor. 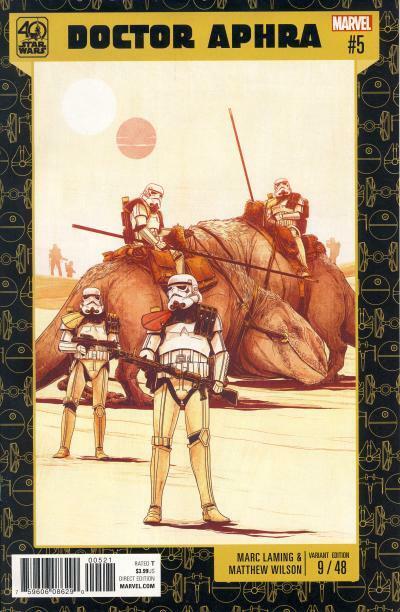 Prior to their appearance in Jedi Council - Acts of War, the planet Yinchorr was used in Crimson Empire #1 as the location of the training facility for the Emperor's Royal Guard. 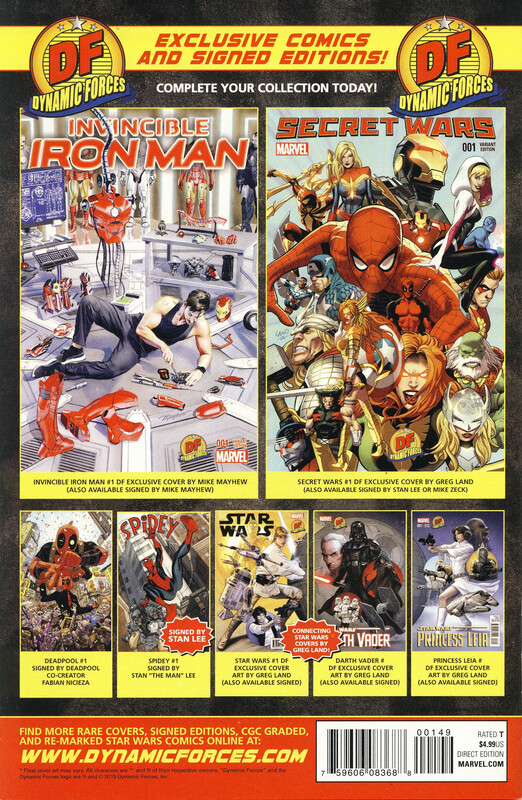 I'm sure longtime followers of my blog have noticed I am not a fan of the huge number of variant covers Marvel is releasing for their Star Wars line. Very few of the variants have been worthwhile, with the black and white incentive variants being the most egregious and clearly a ploy on Marvel's part to make additional money without providing any value. This is not to say all the variants have been bad; some, like the action figure covers, are a nice subset to collect and are readily available. That is the key to me, availability. I reserve my ire for the incentive variants which end up costing collectors more money than a freshly printed comic warrant. A quarter of the Star Wars 40th anniversary covers have been released so far, and the covers are numbered in chronological order according to the movie. This is a nice touch that was unexpected. I'll admit, these covers have been very impressive and are my favorite of the variant cover subsets Marvel has produced to date. Announced at Star Wars Celebration Orlando today, Marvel will be publishing a Captain Phasma 4-issue mini-series in Fall 2017. Marco Checchetto provided the artwork for the Journey to Star Wars: The Force Awakens Shattered Empire mini-series, and he will be working on the art for this Journey to Star Wars: The Last Jedi mini-series. To read more about this new Star Wars title, please read the official Star Wars website posting SWCO 2017: MARVEL REVEALS CAPTAIN PHASMA MINISERIES BRIDGING THE FORCE AWAKENS AND THE LAST JEDI – EXCLUSIVE. It was announced at the Star Wars Celebration in Orlando today that IDW has been granted the license to publish new all-age Star Wars comics. IDW currently publishes comics based on Disney characters, so this is an expansion of their relationship with IDW. 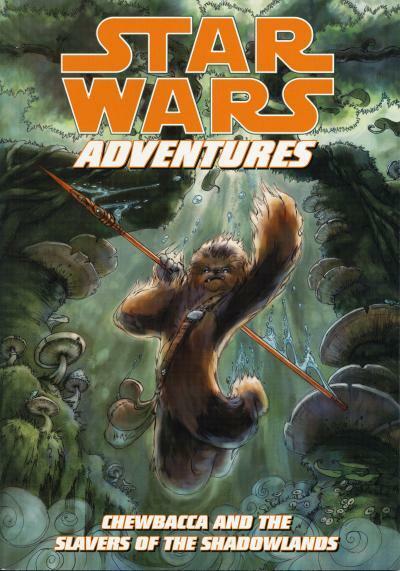 The first title, Star Wars Adventures, will be released in Fall 2017. This follows on the heels of yesterday's Star Wars Force of Destiny animation shorts announcement and shows Disney's commitment to reaching out to new generations of Star Wars fans. You can read more about the news at the Los Angeles Times website in the article Exclusive debut of art from IDW's new 'Star Wars Adventures'.Even more detail is revealed in Comicosity's article IDW to Publish STAR WARS ADVENTURES. In March 2016 Star Wars: The Original Trilogy - A Graphic Novel hardcover was published by Disney-Lucasfilm Press for the U.S. market. 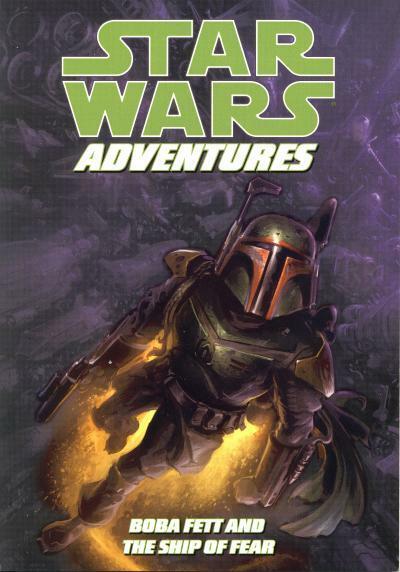 The hardcover collects the three original trilogy movie adaptations previously released overseas in graphic novel form. 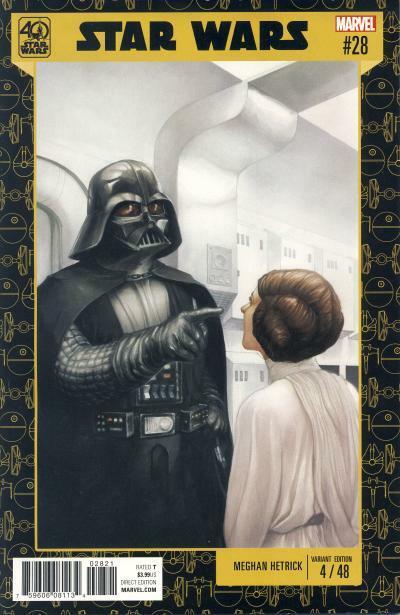 Disney-Lucasfilm Press specializes in publishing Star Wars books for younger readers and the art is reminiscent of a full-length Disney animation feature. 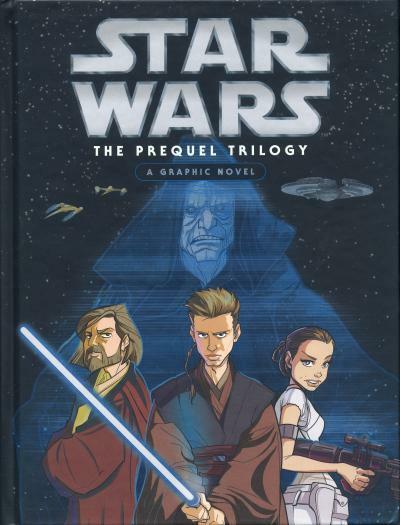 A companion hardcover, Star Wars: The Prequel Trilogy - A Graphic Novel, was just released in March. 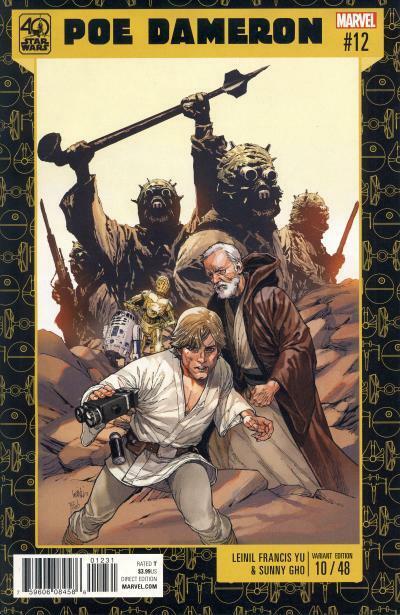 Like the first volume, this volume also collects three previously released graphic novels, but this time for the prequel trilogy movies. Like the first volume, there are entire scenes from the movies that are cut. 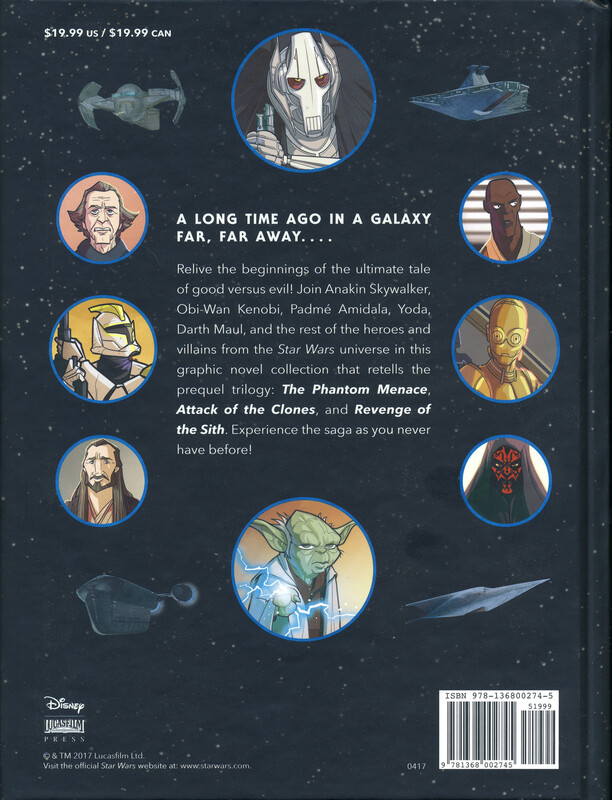 As an example, in The Phantom Menace adaptation, Captain Tarpals is not mentioned and the battle between the Gungans and the Trade Federation droid army is summed up in just a few panels. Instead, during this part of the story, the comic spends time on the confrontations going on in Theed and the space battle above Naboo. Despite the deletions, the main beats of the stories are present and the cuts allow the remaining scenes to be told without feeling rushed. It is clear these retellings are aimed at kids and I know if my children were younger, I would have no qualms reading this book to them, despite some of the darker parts of the stories. As an adult, I had fun reading these new depictions, so having children are not necessary to enjoy them. 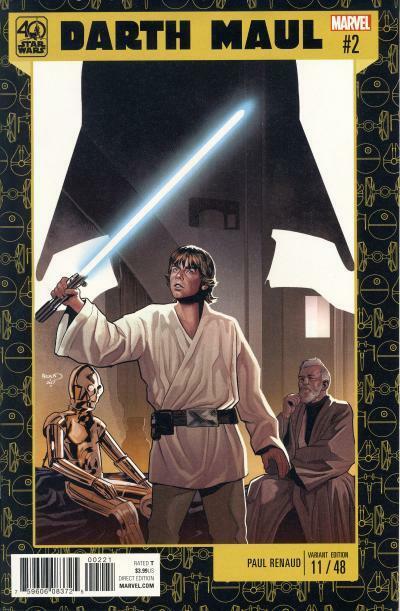 Interestingly, my familiarity with the Dark Horse prequel trilogy adaptations are not as strong as my familiarity with the Marvel adaptations which I have read countless times and I found myself re-reading the Dark Horse versions so I could compare them. The Dark Horse versions are superior for packing more of the movies into the comics, but I feel these are a better read because they allow the stories to breath and have a better flow to them. This Edisi Spesial or Special Edition is a treasury-sized comic published by Cypress. It is titled Perang Di Planit Air or The War on the Water Planet. 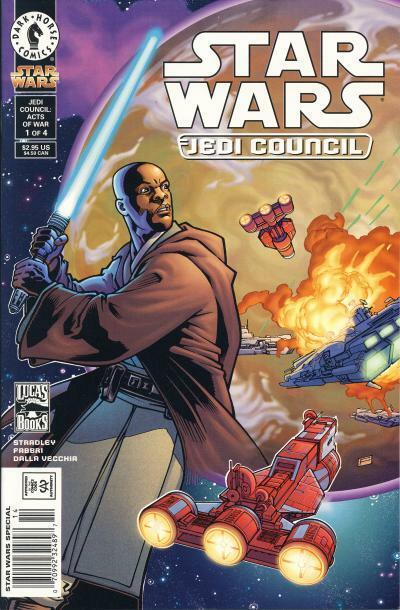 This issue contains Star Wars #11 - 15, redrawn. 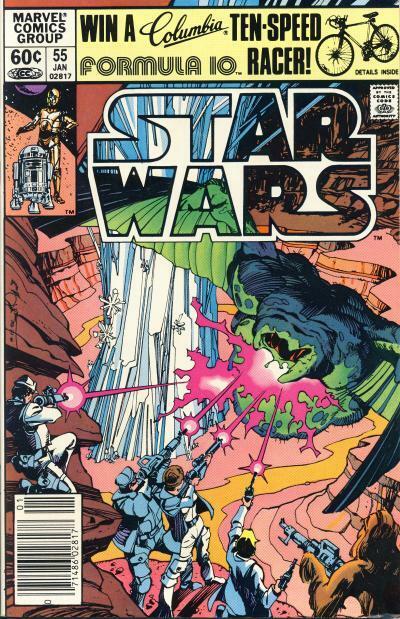 The artwork for the cover is taken from Star Wars #13. It is cropped to fit the treasury format and, by chance, the cropping retains the artists' signatures who worked on the cover, John Byrne and Terry Austin. 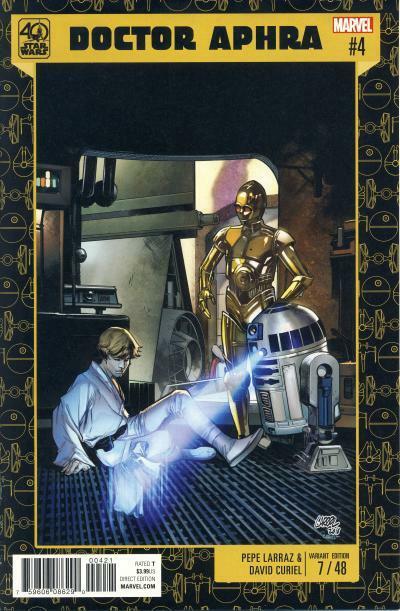 On the original cover, C-3PO exclaims, "Master Luke, this time we don't dare let the Wookiee win! ", a reference to the humorous line he says in the movie, "I suggest a new strategy, R2. Let the Wookiee win." 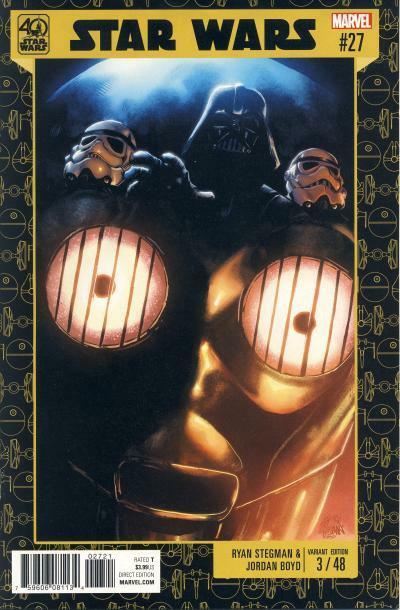 On the Cypress cover, C-3PO is more optimistic proclaiming, "Master Luke, kita harus bisa menghentikan amukan Wookie ini!" or "Master Luke, we should be able to stop the raging Wookie!" Wookiee is spelled incorrectly and not for the first time on a Star Wars product. As you can see on this page, the interior art is redrawn from the original comic. Here is the same page from Star Wars #15. A lot of the detail of the original Carmine Infantino pages are lost in the new artwork. I have very fond memories of reading the original movie adaptation in the treasury format. The larger format just feels appropriate for Star Wars and it is still my preferred format. 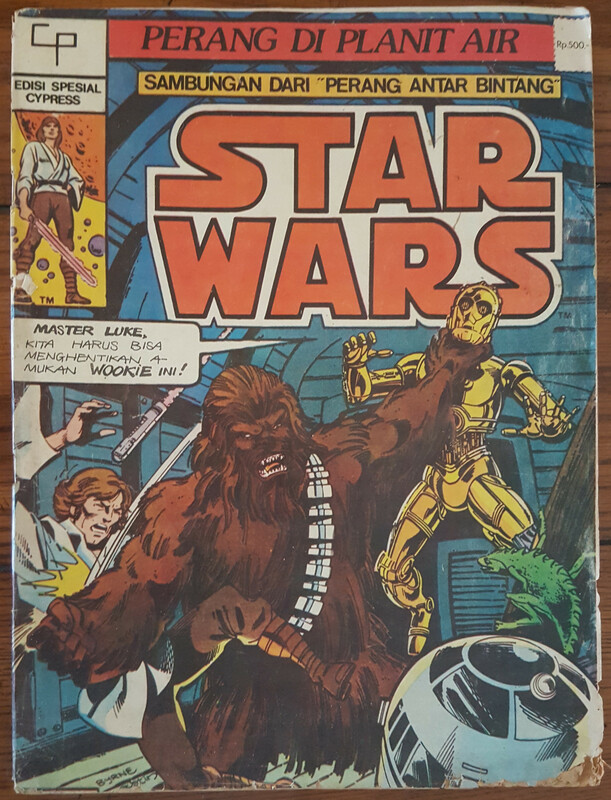 I have a copy of Marvel Special Edition Featuring Star Wars #3 that is well worn from countless hours of leafing through the pages and staring at the artwork. The idea that other issues in the Marvel title were collected in a treasury, even in other countries, is pretty cool. I cannot even imagine the excitement a kid had sitting down and reading the entire Dragon Lords arc presented in this manner. 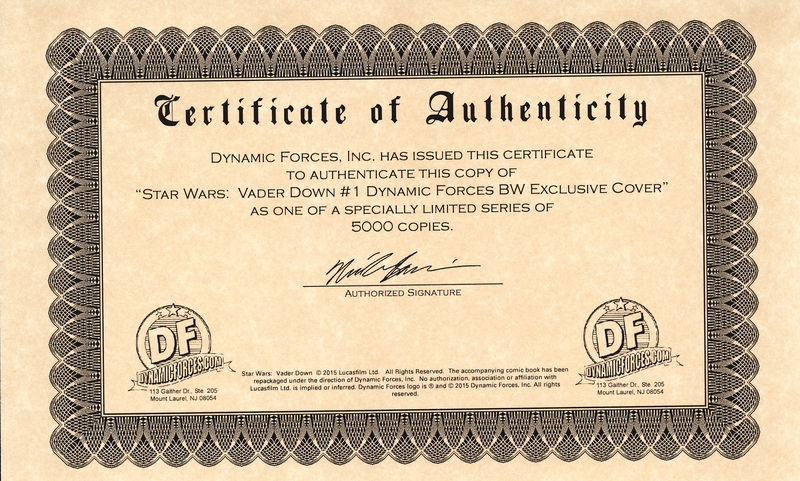 Not all of the Dynamic Forces exclusives released during the Dark Horse era had different art from the standard cover. Most just used a gold foil over the title. Star Wars: Jedi vs. Sith #1 Dynamic Forces gold foil exclusive has new artwork on the cover. This exclusive is limited to 2,500 copies. The prices on these Dynamic Forces exclusives have been rising the past few years and this is one of the more expensive exclusives. Modern Marvel: Two Star Wars: Vader Down #1 Dynamic Forces Exclusives? 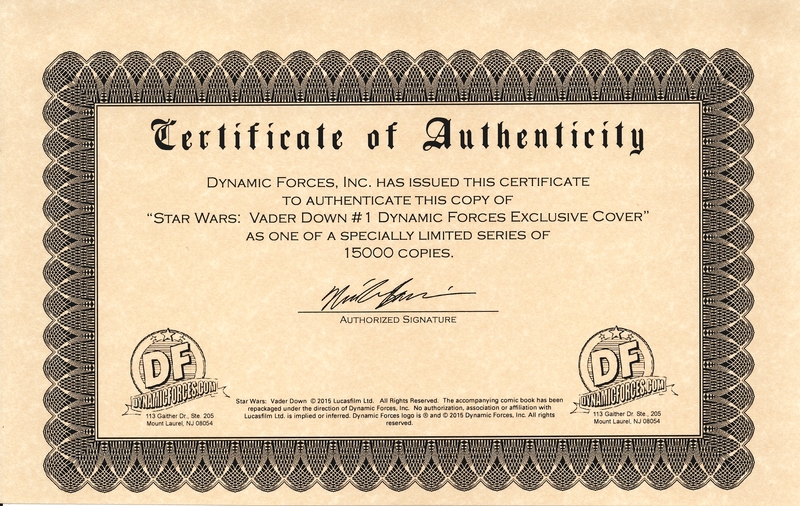 Dynamic Forces is a company that specializes in variant and signed comics. 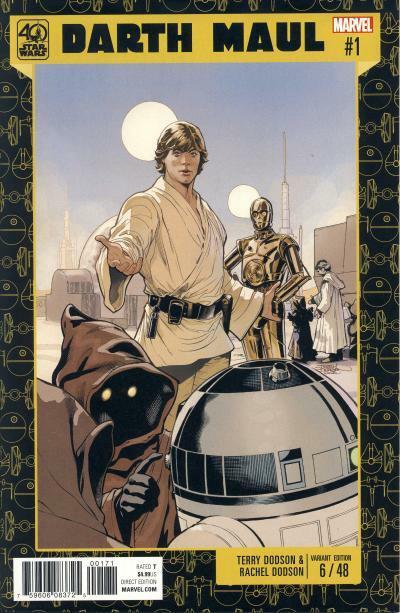 They have been providing exclusive Star Wars comics since 1999 when Dark Horse held the Star Wars license. 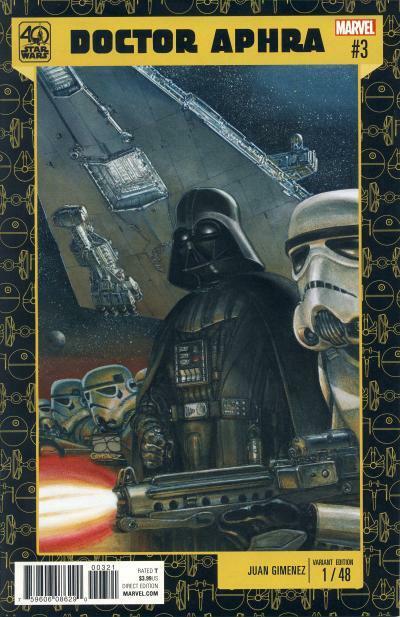 Many of the early exclusives were signed copies or covers that were altered by enhancing the title with gold or holo foil or by applying a special layer to a character on the cover so they would glow in the dark. But they did commission new artwork on some of the covers as well. In this era of variant covers, it only makes sense they would also have exclusives all of which have new cover artwork. Dynamic Forces released two exclusive covers for the Vader Down one-shot. The standard cover is limited to 15,000 copies and the black & white cover is limited to 5,000 copies. If you look closely, on the standard cover, Darth Vader has a slight blue tinge and the background has a very subtle brown tinge which is most apparent on the Stormtroopers. I know when I received this issues I thought, why even bother? but then I remembered I bought each issue. Unless you are holding both issues next to each other, you would be hard pressed to know which copy is which. If the copy still has the certificate, that can help but it is not a foolproof guarantee if someone decides to switch out the certificates. Barring the certificate and trust of the seller, the best way to tell which copy you have is to look at the UPC code on the back of the comic. The standard issue has a UPC box with the number 00148 and the black & white issue shows 00149. Canada is made up of ten provinces; eight are majority English speaking, New Brunswick is bilingual with two-thirds English speaking, and Quebec is majority French speaking. 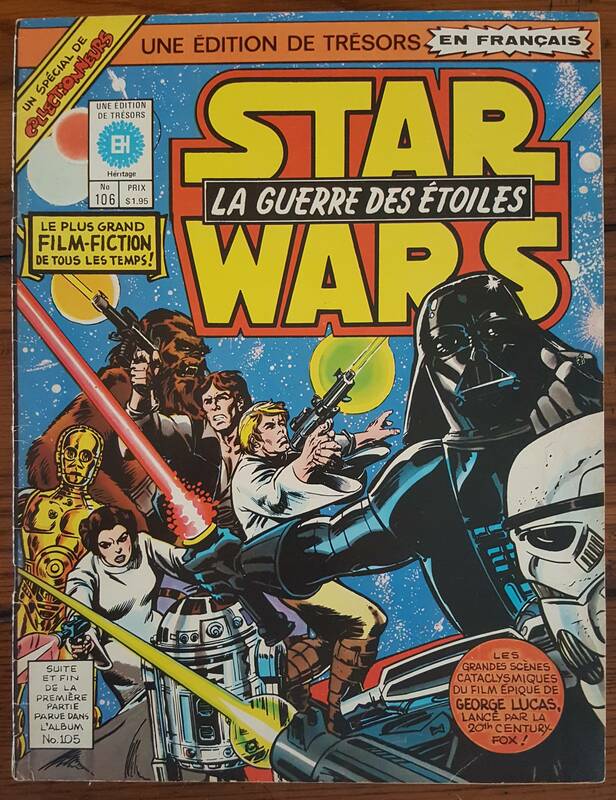 Les Éditions Héritage is a Quebec publisher that translated Marvel's Star Wars comics for the French speaking Canadians. All three original trilogy movies were released in differing formats. 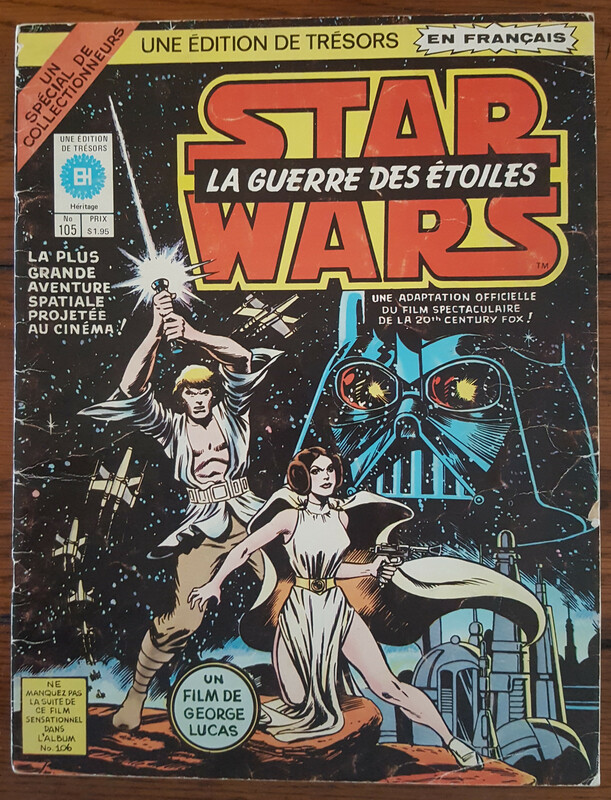 The Star Wars adaptation was first published as two treasury-sized comics and later in standard sized issues in the Marvel Trois-Dans-Un la Guerre des Étoiles title. The Empire Strikes Back was published in a slightly larger than paperback sized book and The Return of the Jedi was released as two standard sized comics. Les Éditions Héritage published 9 issues in their Édition de Trésor or Treasury Edition title from 1976 to 1978. 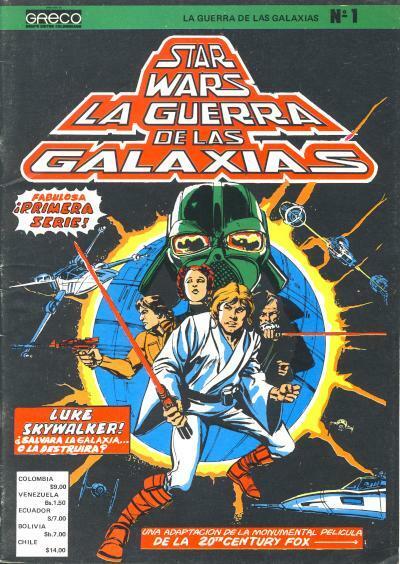 These comics are translations of U.S. treasuries from Marvel Comics and two of the issues, #105 and 106, are translations of the Marvel Special Edition Featuring Star Wars #1 and 2. 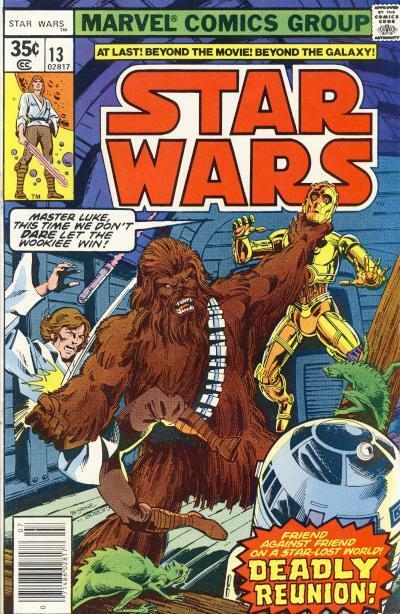 This title starts its number with issue #101, hence the numbers for the two Star Wars issues. The covers use the same artwork as the U.S. editions they translate. Star Wars is in both English and Canadian.